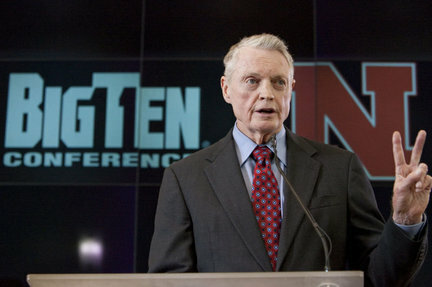 In his storied career as head coach of the Nebraska Cornhuskers, Tom Osborne cemented himself as one of the best offensive tacticians ever. Few could match Dr. Tom when it came to dialing up the perfect play at the perfect time. Now, his call to push Nebraska to move to a new league is playing out like a well-timed option pass. Wisconsin appears to be the class of the conference's legacy programs, and the Baders are replacing their quarterback and two first-round draft picks in offensive tackle Gabe Carimi and defensive end J.J. Watt. The conference title is there for the taking in NU's first year as a member. However, in conjunction with Nebraska's first official day as a member of the Big Ten, ESPN College Football Live ran a segment on Friday's show breaking down the pickle that the Cornhuskers' defense is in this season. As analyst Andre Ware explained, after all those years in the spread-heavy Big 12, NU is taking up residence in the blackest and bluest conference in the country. The beefy boys from Wisconsin and Ohio State and Iowa like to ground and pound. More fullbacks and double-tight sets; fewer jitterbugs in the slot. Bo Pelini and his brother Carl, NU's defensive coordinator, arrived back at Nebraska as head coach in 2008 in the middle of the golden age of the spread. Upstarts like Missouri and Texas Tech were going five wide and operating out of the shotgun on the regular in an effort to force the big boys to keep up. Traditional powers Oklahoma and Texas had decided to follow suit and were putting up huge offensive numbers. Bo and Carl caught up pretty quickly. NU got off to a rocky start in Pelini's first season, as the 'Huskers allowed an average of 28 points per game, ranking 81st in the country. In the last two years, the Blackshirts were back. In both 2009 and 2010, the 'Huskers finished in the top 10 nationally in scoring defense and yards allowed per play. It obviously helps to have bad dudes like tongue-twisters Ndamukong Suh and Prince Amukamara on your side when you're trying to build one of the best defenses in the country. Even so, the Pelinis put plenty of their own ingenuity to work to combat the conference's high-octane offenses. "... It's still a 4-3, but you just have a little smaller WILL linebacker in there. Rather than saying, OK, try to take three linebackers and adjust it to one-back sets, we'd rather take a nickel package and adjust it to the bigger sets." The peso is the kind of invention born out of the necessity of facing some of the best offenses in the nation every week in conference play. Now, all due respect, Big Ten, but let's be honest – you just don't do offense all that well. The prospect of matching wits with guys like Jay Paterno isn't keeping defensive coordinators up at night. For the Pelinis, not having to prepare for a variety of complex spread schemes on a week-to-week basis should make for a refreshing change of pace. NU can't afford for the D to slip up, either. Last year, the Cornhuskers' offense failed to show up in plenty of games. The passing game was competent, at best, for the entire season, and now. Meanwhile, NU's sometimes explosive option attack loses leading rusher Roy Helu, and speedy but slight quarterback Taylor Martinez struggled to stay healthy in '10. (Then there's T-Magic's seemingly tenuous relationship with his head coach.) Factor in the loss of dangerous wideout Niles Paul and three new starters on the line, and just matching last year's uneven performance will be a win. As such, the Pelinis have to get the 'Huskers ready to rock on defense. Luckily for Big Red, they've done this before.